It the real world, couples decide in private that their marriage is over. In Hollywood, they announce it through a publicist. And on reality TV, they center a whole show around the split. As I am sure you have not been living under a rock the past week, I will not bore you with the details. But basically, the official announcement from Jon and Kate Gosselin that they are splitting has been a long time coming, and finally last night the time came. There was a whole bunch of stupid useless suspense built up about this “big announcement” on Monday’s show of Jon & Kate Plus 8, but we all knew what it was. And it was exactly what we all thought. Soft-spoken Jon Gosselin and his over-bearing wife with horrible hair Kate are getting divorced. During Monday’s show, Kate Gosselin says, “I’m not very fond of the idea, personally, but I know it’s necessary because my goal is peace for the kids.” So, basically the beotch got her booty dumped. Even though they have decided to split, the show will go on! Kate says it’s “for the kids”…we say, gotta maintain that million dollar lifestyle, y’all! In fact, we noticed last night that Kate needs a pedicure…badly. 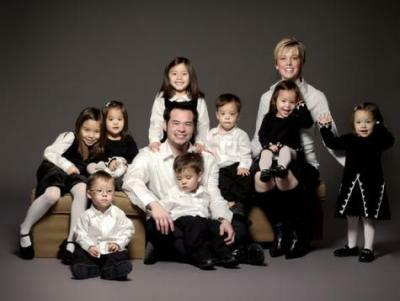 Update: TLC has decided the Gosselin’s show Jon & Kate Plus 8 will halt production and go on hiatus until August 3rd. TLC said next Monday would be a clip package with some new footage, but that the next all-new episode would be on Aug. 3. People close to the show say the desire to take a production break came from the network. Because of all the turmoil in the Gosselin’s marriage, TLC does not have enough footage to put together new episodes right now as its production schedule had become very last minute. Episodes this season were often completed as late as the day of airing. 50 queries in 0.769 seconds.